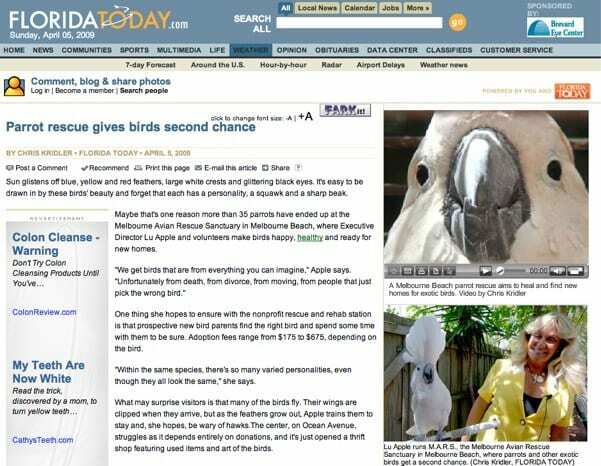 Story about the Melbourne Avian Rescue Sanctuary in "Florida Today"
We’re proud to announce that we made headlines today! The newspaper “Florida Today”, with a respectable circulation of 92,285 for its Sunday edition, dedicated a story to the Melbourne Avian Rescue Sanctuary. The article titled “Parrot rescue gives birds a second chance” is featured in “Life” section on the paper. The funny thing is I didn’t even realize the video would be seen by anybody much less available on the website of Florida Today! Wish I would have had some time to put some lip gloss on! 🙂 But this is certainly a terrific great opportunity to spread the word and the needs of M.A.R.S.! As the article mentions, our Florida parrot rescue organization entirely depends on financial contributions. We’re also looking for donations for our yard sales and thrift shop. Please contact us if you have something to donate. M.A.R.S. is also in need of carpenters to help with repairs, the roof, the driveway and building aviaries. Get in touch with us if you can help us (or know somebody who has the expertise)! Thanks to “Florida Today” for the great coverage!